The electronic module ARES is the central element of the system. It is a cable-free multisensor module which registeres and stores bio-physiological data. Such data like a three channel ECG, body position and movement profile, temperature and skin impedance are recorded. 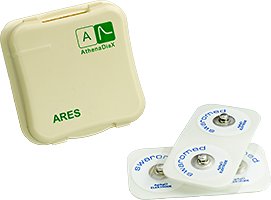 ARES is reuseable, handling and application are quick and easy. All signals are recorded completely without data reduction for up to 7 days. This allows gapless high-quality monitoring without compromises.